3.04.19 - Cincinnati - Today was Day One of the long awaited gerrymandering trial which is being heard in front of a three federal judge panel in Cincinnati. The trial is expected to last about two weeks. Articles will be posted as they become available. 2.08.19 - One of the last 'acts' that Mike DeWine did as Ohio Attorney General was to file a motion to dismiss the lawsuit that is in front of a three-judge panel in federal court in Cincinnati. DeWine continued his penchant for wasting Ohioans tax dollars. Fortunately, late today the same three-judge panel dismissed DeWine's request. Thus, the lawsuit will continue as scheduled on March 4. Below are links to important articles about this suit. 9.28.18 - CINCINNATI - A proposed Ohio congressional district map to strip the state of its politically gerrymandered voting districts in time for the 2020 election was offered up to a federal court Friday as part of a pending suit challenging the current map. 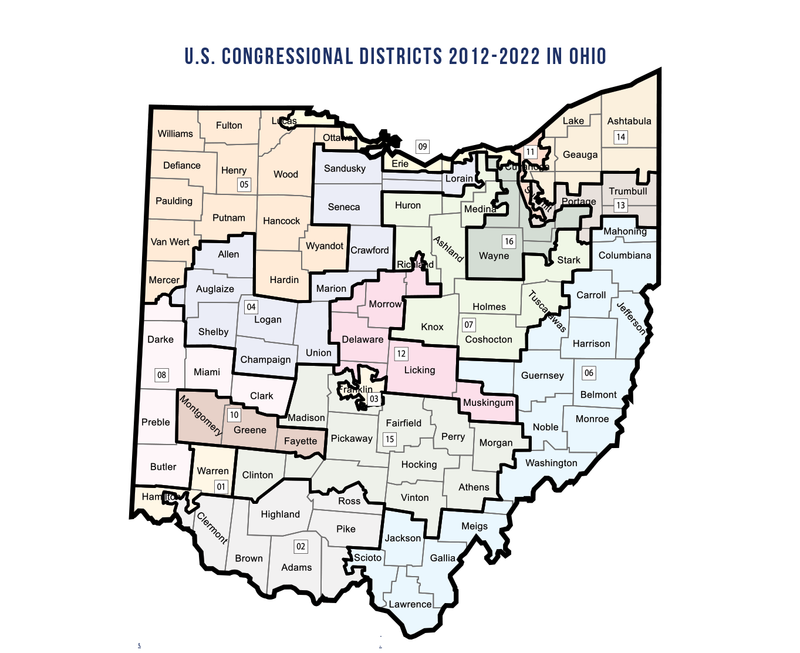 Proposed new Ohio congressional district map submitted to federal court. A three-judge panel in Cincinnati has scheduled a trial for March 4 for the suit, originally filed in May. The judges have allowed numerous Republican lawmakers and voters to intervene in the lawsuit. Named as defendants were elected leaders, including Secretary of State Jon Husted and Gov. John Kasich, two Republicans were outspoken against gerrymandering, although Kasich signed the disputed map into law. Husted, who is now running for lieutenant governor, questioned the timing. "Why did they wait six years to file a lawsuit challenging the maps? These groups should respect the will of Ohio's voters who overwhelmingly approved a constitutional amendment earlier this month that established a new, bipartisan process for drawing congressional districts starting in 2021," he said in a statement released after the suit was filed. for voting FOR Issue 1 - May 8 Primary Election! 8.17.18 - CLEVELAND, Ohio -- Three federal judges have rejected a request by Republican elected leaders in Ohio to dismiss a lawsuit that says the judges should toss out the state's congressional district map because it's gerrymandered. Judges Karen Nelson Moore, Timothy Black and Michael Watson ruled Wednesday that the constitutional violations the group challenging Ohio's map allege are still germane despite a U.S. Supreme Court decision on the issue from earlier this year. The Supreme Court overturned lower-court decisions in similar gerrymandering lawsuits in Wisconsin and Maryland on technical grounds and did not rule on the merits of the lawsuits themselves. Republican elected officials in Ohio tried to use that ruling as a basis to have the lawsuit filed in May against them dismissed. The judges disagreed that the Supreme Court case and others preclude them from hearing Ohio's gerrymandering lawsuit. They also noted that while it's still early in the litigation and that they cannot decide whether the challenges have merit, the plaintiffs have shown enough for the case to proceed. To read entire article, please visit here. 6.26.18 - The ACLU of Ohio, Ohio A. Philip Randolph Institute, League of Women Voters Ohio along with sixteen Ohio voters - one in each of the congressional districts - filed an amended complaint in U.S. District Court in Cincinnati to strike down Ohio's current congressional map to ensure more balanced districts are established in time for 2020 elections. In addition, new plaintiffs were added to the lawsuit, including the Northeast Ohio Young Black Democrats, the Ohio State University College Democrats, and the Hamilton County Young Democrats.